Home / News / 3 Types Of Plungers, Which Is Best? Clogged drains are a common plumbing problem in most households and in many cases can be solved without the need of a technician. Learning to clear a clog with a plunger is quite easy. Plus, plungers are both inexpensive and easy to use. There are numerous types of plungers; each designed to be used on different types of drains. Check out how and where it will be used and decide from there. 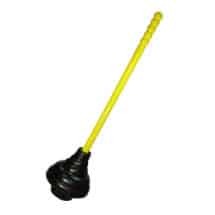 This is the plunger most people are familiar with or think of when talking about plungers. Sink plungers will have a rubber cup at the end of a straight handle. This plunger is good for sinks both in bathrooms and kitchens but can also be used in bathtubs. This type of plunger works well on a flat surface where the cup can lay flat over the drain and create the vacuum necessary to properly dislodge the clog. It doesn’t work well for toilet clog since it often cannot get a proper seal to create suction. These plungers are designed for clearing toilet clogs. They have a smaller cup that fits over the drain perfectly inside the toilet bowl. It is not the easiest plunger to use but is effective. With the smaller cup the down-side is if not fitted properly it can be hard to control. Plungers for toilets also have a cup like a sink plunger, but it also has a soft rubber flap that folds out from inside the cup. The flap fits quite well over the toilet drain making it easy to form the necessary suction to clear a clog. With the flap folded inside the cup this plunger can also be used on a sink or tub drain to create a seal. The flap, provides flexibility to allow it to fit just about any drain. Plunge straight and vertical– Angling the plunger won’t allow you to get the proper force you need and the seal can come loose. Get air out of the plunger cup– Press the plunger down slowly to create suction and reduce air in the cup. This will help create a better seal. Make sure the plunger is submerged– If there is not enough water to submerge the plunger, add water from a cup or bucket.